After the potato latkes, then what? Here are some recipes honoring the oil and/or dairy traditions that have caught my eye for savoring Hanukkah this year. At the bottom are also links to a few personal recipes that I like to revisit for the holiday. Marquesitas by Pati Jinich—Pati calls these hard wafer rolls, but I see them as delightfully crispy blintzes—filled with Nutella and cheese no less! Olive Oil Challah by Melissa Clark—Olive oil works remarkably well in breads and baked goods and I can’t believe I haven’t tried it in my challah before now. Omit the orange zest, if like me, you aren’t sold on citrusing up your challah. Bumuelos by Susan Barocas—Create a batter, drop by spoonfuls in hot oil, coat with syrup, enjoy. This Sephardic treat sounds wonderful. Zucchini and Cheddar Latkes by Emily Landsman (with video! )—I’m partial to the potato version, but to branch out, these look pretty good—especially when you walk through the steps with Emily on video. Chocolate-Lime Sufganiyot by Amy Kritzer (featured in Hadassah Magazine). The classic Israeli doughnuts get an amazing-sounding filling in Amy’s new recipe. Lemon Olive Oil Semolina Cakes by Paula Shoyer—In contrast to much of the season’s foods, these sound so fresh. Fried Artichokes by Joan Nathan—If you ever wanted to make the Jewish-Italian classic artichokes Jewish-style, Hanukkah is the perfect time. These babies are deep-fried—twice! Here is a straightforward version from Joan Nathan. 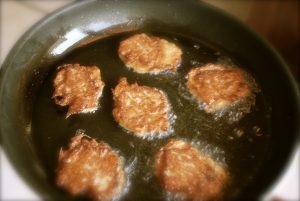 Jewish Food Experience’s Top 8 Recipes for Chanukah 2016—My fritters are on this list but that’s not why I love it. 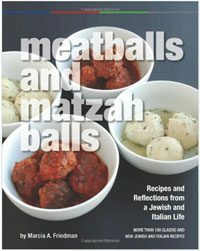 It’s full of innovative ideas for Hanukkah recipes, including leek fritters, Moroccan beignets, and caramelized cauliflower. Smoked Gouda Risotto Bal ls—if you’ve been following me awhile, you know I love my risotto. 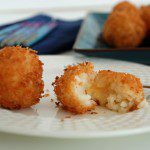 Turned into a fried ball stuffed with smoky cheese? Even better. Sweet Jewish-Italian Hanukkah Fritters with Figs and Sambuca Honey—Move over doughnuts! Fritters are traditional for both Hanukkah and Christmas in Italy, and this new version gets flavor from figs and Sambuca. Spaghetti Aglio Olio—This simple and flavorful Italian classic lets you savor good quality olive oil—and no deep frying involved. Lemon-Ricotta Pancakes—The first Hanukkah pancakes were Italian cheese pancakes, and in this modern take, ricotta creates a rich tender pancake. It’s completed with a cream spiked with Limoncello.